It’s a tragedy that never should have happened. 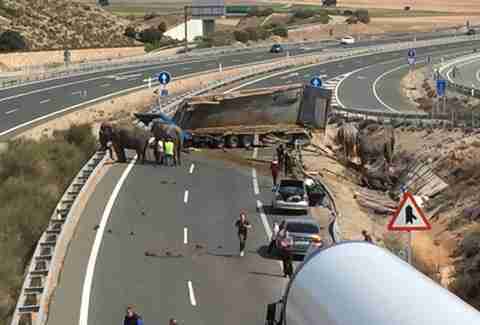 On Monday, a semitruck carrying five elephants, held captive by a European circus company, overturned along a highway in Spain. One animal was killed in the horrific accident, while four remaining survivors were left injured and disoriented as traffic backed up around them. Photos of the aftermath, which shut down the road for more than an hour, spread quickly online — exexposing the dangers faced by animals trucked from place to place for people's entertainment. The scene was chaotic — and heartbreaking. Al menos 4 elefantes heridos tras volcar un camión en la A-30 a su paso por Pozo Cañada. The surviving elephants remained calm as first responders arrived to the scene. Several were seen huddling close to one another for comfort. Two of the elephants were left with serious injuries. One was photographed bleeding from abrasions resulting from her spill on the roadway. Three of the elephants were still able to walk, and were rounded up and transported to safety. The fourth, with an injured foot, required the use of a crane. Before the body of the deceased elephant could be carried away, two onlookers approached to express their grief that her life was lost. "I don't know these two people, but their actions right now deserve the greatest respect," firefighters responding to the incident wrote on Twitter. The four surviving elephants were taken to a nearby veterinary facility to undergo treatment for their injuries. Their fate from there, sadly, remains uncertain. Activists from Spain's Animalist Party Against Mistreatment of Animals (PACMA) are petitioning the government to grant a reprieve to the four remaining elephants to prevent their return to the circus that owns them — and calling for an end to the exploitation of animals like them. "The life of a circus animal is hell. They live in deplorable conditions and no other party does anything for them. It is time to open our eyes to the cruelty of this sector," Silvia Barquero, president of PACMA, said in a press release. "An accident on the highway is not the place where anyone wants to see an elephant. But the animals would not cross hoops of fire, walk on two legs or ride a bike, except for fear of reprisals that involves not doing so." PACMA later shared these photos of the elephants from their last performance. 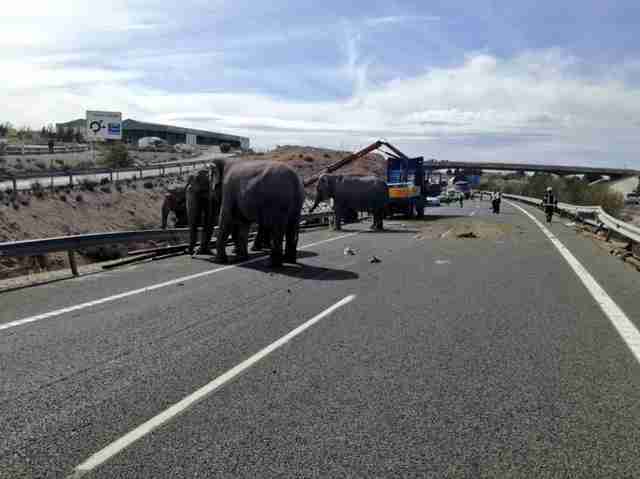 Esta fue la última 'actuación' de las 5 elefantas del Gottani antes de subirse al camión que acabó con la vida de una de ellas. So far, more than 60,000 people have signed PACMA's petition — a heartening indication that the horrific incident could effect real change across the country. But such deadly consequences for circus animals, routinely shipped from place to place, aren't so uncommon. Last September, a tiger belonging to a former Ringling Bros. circus trainer was shot and killed by police after escaping a transport vehicle. “This incident sadly illustrates just some of the immense risks and suffering caused by keeping exotic wild animals in captivity for entertainment," Elizabeth Hogan, U.S. wildlife campaign manager for World Animal Protection, told The Dodo at the time. "The use of wild animals for entertainment causes immense animal suffering at every stage." And that suffering often takes place behind the scenes. Ringling Bros., once the United States' largest circus, has since shut down due to public pressure, but animals are still being forced to perform elsewhere — meaning incidents like the one this week in Spain are bound to be repeated. Visit Born Free USA's website to learn more about the dangers facing circus animals, and what you can do to help stop their exploitation.